HOMER — The Homer Spit, once excluded from the commercial cannabis narrative in the city, has been brought back into the conversation. Members of the Cannabis Advisory Commission voted unanimously at their Aug. 24 meeting to recommend the Homer City Council open the Homer Spit to commercial marijuana businesses. The Spit had previously been excluded from the areas those businesses are allowed through the city’s zoning process when it adopted regulations for cannabis. Currently, marijuana businesses are permitted in Homer’s central business district, general commercial districts one and two, and the East End mixed use district. The council would have to make an amendment to the city code to allow marijuana businesses on the Spit, and any business would probably have to be on private property. Commission Vice Chair Carrie Harris brought the recommendation up, saying she has heard from people in town expressing a wish to see cannabis allowed on the Spit. There are a few private land owners on the Spit interested in getting into the marijuana industry, Harris said. City Planner Rick Abboud said leasing city land for any commercial cannabis use raises federal legal issues. “We have advice from the city attorney that we would not want to support a marijuana enterprise on our property because of the implication it might affect our relationships with the federal government and federal funding,” Abboud said. 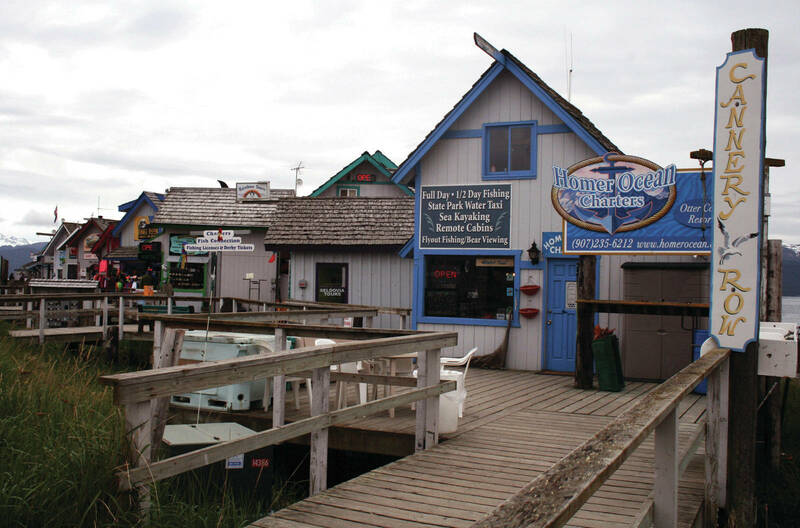 According to the Alcohol and Marijuana Control Office list of license applicants, one business, Homer Spit Cannabis Company, has initiated an application for a retail store on the Spit on a city lot leased to Billy Sullivan near Fish Dock Road. Sullivan said his son, Nils, filed the application. “He’s just tire kicking, I guess,” Sullivan said. AMCO administrative office Craig Douglas said any license application would have to go to the city for review that it complied with zoning regulations. Sullivan’s application still isn’t complete. Harris said after the meeting that, accounting for the areas designated as wetlands within city limits that overlap with the areas commercial cannabis is allowed, there aren’t many spots in town where the businesses are easily established. Commissioner David Lewis, a council representative, supported the motion to make the recommendation but said he doesn’t think it will make it past the council. “At this time I really don’t think the council would approve it, just because I feel it would be a 4-3 vote,” he said. Lewis said it might be better to wait until a cannabis business gets established in town to see how it goes before trying to open the Spit to them as well. One retail pot shop, Uncle Herb’s on Ocean Drive, could open in time for the holiday season if its application gets approved by the Marijuana Control Board and the city, and it passes state inspections. Lloyd Stiassny, a former Homer resident, owns another Uncle Herb’s in Anchorage. The Homer shop would go in Stiassny’s building at 1213 Ocean Drive in an office now rented to a bear viewing company. When it opens, it will be the city of Homer’s first commercial cannabis enterprise. Three farms already have licenses outside city limits. “We’re kind of excited,” Stiassny said. Homer Police Chief Mark Robl, another commissioner, brought up the concern that having marijuana available on the Spit could increase the likelihood of consumers bringing product onto charter fishing boats, which could lead to problems for charter owners since the waters they travel are federal and governed by the U.S. Coast Guard. Lewis countered that the chance of that happening would always exist, no matter where a cannabis business was located in town, since it depends on the personal responsibility of the buyer and how they use the product. The commissioners also voted to recommend the council not allow smoking marijuana on-site in cannabis establishments. The state’s Marijuana Control Board has proposed allowing on-site consumption, and would be the first state to do so if the proposal is successful. The board is currently taking public comments on the measure. Robl objected to the smoking aspect of on-site consumption, saying it would pose a risk of intoxication to officers if they ever had to respond to a call in a marijuana establishment. If an officer entered a cannabis business and was exposed to smoke, that officer would have to be taken off duty for however long it took for the THC to leave his or her system, Robl said. This is not an established state or federal standard, but based on the practices Robl has researched of police departments in Lower 48 states where cannabis is legal. “If there’s a police officer exposed for more than a few minutes, they send that officer home,” he said. While Robl said this situation does not happen very often, this kind of policy is something the Homer Police Department would have to adopt if on-site smoking in marijuana businesses was allowed. An officer would automatically have to be sent home if exposed to marijuana, but would not automatically have to be tested for THC levels. That would only happen if an officer responded to a call where on-site smoking was allowed, and immediately after had to respond to a serious incident like a shooting or a bad vehicle crash. The likelihood for lawsuits if it was found the officer was intoxicated while responding to that kind of event would necessitate blood and urine testing, Robl said. There is a company currently working on developing a portable blood testing device to test for marijuana intoxication, Robl said, which would come in handy for testing officers if on-site smoking ends up being allowed. Officers in the state of Alaska are not allowed to use marijuana recreationally or be involved in the marijuana industry; if they do, their certification is threatened. At the meeting, Lewis questioned whether on-site smoking could be allowed if establishments used smoke eaters to clear the rooms of intoxicating smoke. Soldotna Police Chief Peter Mlynarik, chair of the Marijuana Control Board, said that in their research on on-site smoking, the board found a study that said there are no filtration systems currently that can adequately clear the air of smoke. “That’s what that source said. That there wasn’t a way to remove all the particulates or chemicals from smoke with a filtration system or a ventilation system,” Mlynarik said. Air cleaning devices like the Smokeeter can remove 90 percent of the particulates in air, said Dan Schroeder of Air Cleaning Specialists, which represents Smokeeter and the Clean Leaf and Blue Ox air cleaners, systems used on commercial indoor marijuana farms. The problem is that the Smokeeter can’t clean the air in a room before it gets to the filter. “There’s no way of completely eliminating any chance of second-hand smoke for first responders,” Schroeder said. Robl said that, if an officer became intoxicated, he or she would be safe if they could prove the intoxication came from second-hand smoke. He said he hopes the council will take the commission’s recommendation and that his department won’t have to deal with the on-site smoke. Reach Megan Pacer at [email protected]. Michael Armstrong also contributed to this story.